The prime minister must introduce direct rule in Northern Ireland immediately if the UK leaves the EU without a deal on March 29, UUP leader Robin Swann has said. Theresa May arrived at Stormont House in Belfast today for a series of meetings with Northern Ireland’s main political parties, with Mr Swann’s party being first in the queue. Speaking ahead of the meeting, Mr Swann said his party had a “very clear message” for the prime minister. With just 50 days to go until the UK’s scheduled exit date from the EU, the North Antrim MLA said Mrs May will have to put direct rule government in place for Northern Ireland by March 30 if there is no extension of Article 50. He added that the Province would need “political leadership and direction” in the event of a no-deal scenario. “We are not far from the 29th March, we as a party don’t see a no-deal as a positive situation or something that suits Northern Ireland or the UK,” he said. After his meeting, Mr Swann claimed Mrs May appeared reluctant to talk about efforts to restore power-sharing. “The conversation we were having with the prime minister was initially about Brexit, we had to drag her to a place were we actually started to talk about how we get these institutions back up and running,” he said. SDLP leader Colum Eastwood, who was third in to see Mrs May, said she needed to understand there was “no alternative” to the backstop. “The bottom line is this – for the people of Northern Ireland, for our peace process, for all of our political progress, we need to remain within the customs union and single market in order to avoid a hard border,” he said. 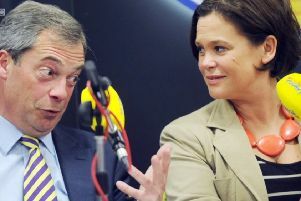 Following her discussions with the PM, Sinn Fein president Mary Lou McDonald accused Mrs May of coming to Belfast with “no plan, no credibility and no honour”. Mrs May’s partners in government, the DUP, were the final party to meet the PM at Stormont House. Speaking afterwards, DUP leader Arlene Foster reiterated her position that the backstop is the “main problem”. She said her party has an “ongoing engagement” with the government over Brexit. “This was another useful opportunity to press for a deal which works for the entire United Kingdom. We want a deal which respects the Union and the referendum result,” she said. “Our message was very simple. The draft Withdrawal Agreement is flawed because the backstop would undermine the economic and constitutional integrity of the United Kingdom. “The backstop is the main problem. It must be dealt with in the terms set out in the Brady Amendment which secured a majority in the House of Commons. “During that debate, the prime minister made commitments that there would be legally binding changes to the Withdrawal Agreement. That is what is needed.